Once when meditating at a cemetery, Rahula Gupta gave gold to his teacher, Maitri-pa, and said, “Since Tibetans are poor, please give me instructions for making wealth with quick results.” Maitri-pa said: “There is such a teaching; it is called ‘Yeshe Ki Norbu’, One Who Dwells in the Forest or Mahakala of the Seng-teng Wood; Wishfulfilling Jewel Mahakala sometimes called Great Compassionate Mahakala. That deity protects from the fear of life end death. He conquers gods, demons and human beings. He is one who naturally gives wealth, food and companions. He destroys all demons, evils, and enemies. Such are the powers of this deity. Avalokitesvara stayed for countless years at the mountain called Potala, working day and night for the benefit of all sentient beings. 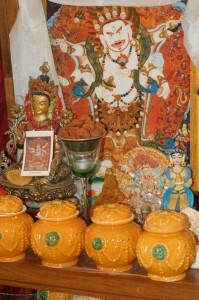 After that long period Avalokitesvara thought, by now the suffering of sentient beings is probably very much lessened. He looked down and discovered that the quantity of sentient beings was just the same, and because it was a degenerated time, their passions and evil deeds were even greater. He said, ‘Now even I am not able to rescue even one sentient being, ” thus breaking his oath. His head flew into a thousand pieces. His guru, Amitabha, came to him and said, “It is very bad for you to be so discouraged. To expiate that mistake you must take an even greater oath then before.’ He reached out and magically assembled the thousand pieces into eleven heads. Avolokitesvara thought to himself, Oh no, I spent such a long time. How can I do more? How can I get such energy again?’ He was so tired, so discouraged, and for seven days he was unconscious. Finally, he recovered and he thought, degenerated sentient beings have short lives and bad luck. they are easily hurt, easily sick always subjected to adverse circumstances. They exhaust their energy just in order to eat; they work all day. There is not leisure to meditate. They are always harried by negative forces; they are not able to maintain their vows; and they engage in unmoral actions. Even most Dharma practitioners or spiritual people are caught in confusions and few the Bardo state. Under-standing that, the eleven-headed Avalokitesvara thought, sentient beings need a deity experienced by praying, without taking too long. One who protects from life and death; who brings wealth end companions naturally and who devastates demons and enemies. I should become a heruka with the abilities to accomplish these common and supreme siddhis. Having thought that, he manifested a dark blue HUM in his heart. 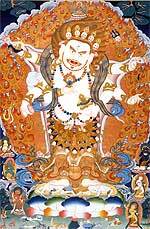 From that HUM come a six-armed Mahakala, the one who fulfills the wishes of sentient beings. At the same time, there were tremendous earthquakes of six different kinds. Then, the once born, the deity born, the Tathagatas of the three times said, “Oh nobly born one, well done, this caring for sentient beings,” and they gave him empowerments. Rahula Gupta traveled to Tibet and gave these teachings to his student, the Tibetan Lama Kyon-Bo Naljor, a master of the Kagyu who lived in the Shang Valley near Shigatze. CLICK HERE TO ORDER A VASE!